Added by Bill Bowman on November 25, 2018. “Santa Paws” greeted canine visitors at the Franklin Township Animal Shelter Open House. Santa began his rounds early in Franklin on Nov. 24 at the Franklin Township Animal Shelter on DeMott Lane for its annual Santa Open House. 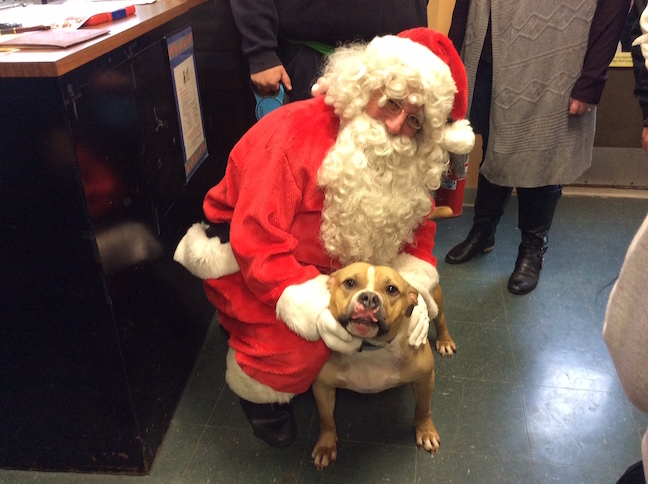 Santa Bob Pezzano, past-president of Second Chance for Animals – the organization that helps fund the shelter – greeted animal lovers of all ages, as well as a few canine visitors. “I call her the animal whisperer, she handles the hardest animals with ease,” he said. Light refreshments were available, as well as hand-crafted animal-themed frames, earrings and toys, created by township resident Janet Mangin. Mangin and Nora Breen have been creating these items for more than 11 years and they are displayed at township events, as well as shelter events, such as the upcoming Santa Paws, Dec. 1 and 8. The shelter has ongoing needs for dog and cat food, toys, cleaning supplies, towels, sheets and blankets. The next event to benefit the animal shelter and other township animals in need is “Photos with Santa Paws,” – pet and pet family photos with “Santa Paws” – 10:30 a.m. to 3 p.m. Dec. 1 and 8 at Franklin Middle School, Sampson G. Smith campus, 1649 Amwell Rd. Bring a donation of pet food and receive a free gift. For more information, www.secondchanceforanimals.org, or email, santapaws@secondchanceforanimals.org, or (732) 748-7232.